Payment Gateways provide a secure environment for credit card and Automated Clearing House (ACH) transactions between Arena and a merchant that authorizes the payment. At install, there are no payment gateways. If accepting both credit and ACH payment options, your organization needs two merchant accounts, one for each payment method (unless using ShelbyNext | Giving). Once you obtain your provider account information, you are ready to add them to this page. A payment gateway is required for online giving, event and mission registration. Arena parses the payment information between contributions and events, regardless of the payment gateway. •PayPal™ Payflow Pro/PayPal™ Express - PayFlowPro integration requires a licensed, local installation of Arena and the merchant meets the PCI compliance standards to handle card holder information on premise. •TransNational Bankcard is an integrated payment gateway provider for Arena Self-Hosted environments. 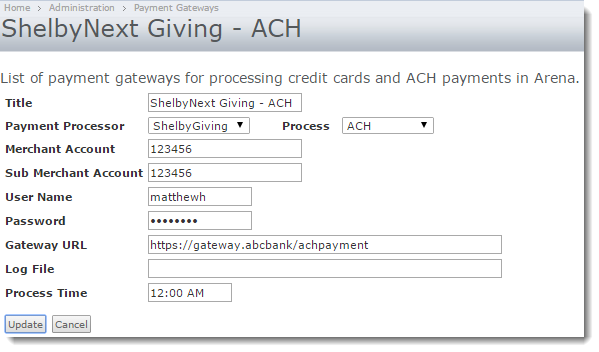 •ShelbyNext | Giving and CashLINQ (Ministry LINQ) are integrated payment gateways for Arena Hosted environments and use a redirect to their PCI compliant site where the card holder information is captured/maintained, meeting the PCI compliance requirements. To add a new payment gateway, click the Add New Gateway Account button and enter the required fields (Title, Payment Processor, and Merchant Account). When you are finished, click the Update button. •Payment Processor – Select provider from the drop-down list. •Process – Select either Credit Card or ACH. ACH is automatic bank drafts where member provides checking or savings account information. If you have both a credit card and ACH for a provider, create two payment gateways, one for each payment method. •Merchant Account – Enter the merchant number provided to you by the provider. •Sub-Merchant Account – Enter the sub-merchant number provided to you by the provider. This is not used for all providers. •User Name – Enter the user name for the account. •Password – Enter the password for the provider account. •Log File – This is the option to enable logging. Enter a .TXT file path to the web server where you want to store the logging data. (e.g., C:\Program File (x86)\ArenaChMS\Arena\GatewayLog.TXT). •Process Time – Enter the time the provider batches processed payments. After clicking the Update button, the Payment Gateways list appears. All fields display on the Gateway List except Sub Account, Password, and Log File.